HOW ON-GRID INVERTER WORKS ? HomeBlogBlogHOW ON-GRID INVERTER WORKS ? · HOW ON-GRID INVERTER WORKS ??? · An On-Grid inverter converts Direct Current (DC) into an alternating current (AC) suitable for injecting into an electrical power grid. On-Grid inverters are used between local electrical power generators such as: solar panel, wind turbine, hydro-electric, and the grid. · On-Grid inverters works by testing the output of the solar panel it is connected to and adjusting its feed into the grid. The most common technique is to increase the loading to the panel slightly and measuring the power absorbed from it. · Fronius was founded in Austria in 1945. It has started its career with the manufacturing of battery chargers and welding transformers. 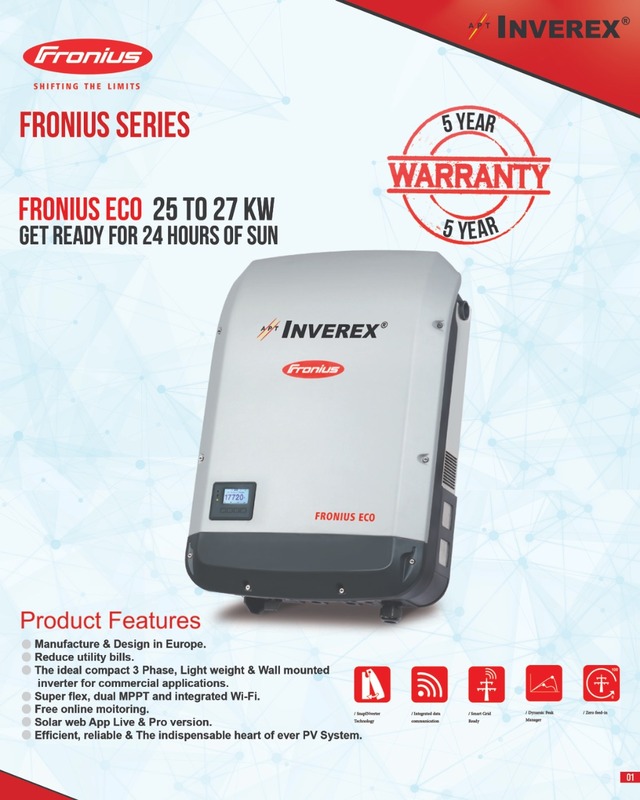 Since developing their very first solar inverter in 1995, Fronius has grown into a solar inverter manufacturing powerhouse, developing sustainable energy technologies and solutions. How On-Grid solar system works? On-Grid inverter coverts DC (Direct Current) from Solar Panels to AC (Alternating Current) and supply it to households & to the grid if the system is providing more energy than the consumption of households. The home owner will receive a credit from electric utility company in form of KWh (Kilo-watt hours) or Units. · Affects on the amount of solar energy generation? Solar energy system effectively depends on the climate, dust, clouds, shading and latitude of the point of the solar system. To get rid of these obstacles in solar energy generation, the owner of such solar system must have knowledge about the ideal situation for perfectly working solar system. · What is the cost of On-Grid System? Prices vary according to size and location where On-Grid solar system supposed to be installed. Try our quick solar quote tool to determine the cost. · How will I get paid from utility company? As utility company charge you an electricity bills against their specified tariff for residential, commercial or industrial consumption along with surge charges and taxes. On-Grid solar system owners are paid by the utility company for the electricity their system generates. There are two different types of tariffs, gross and net. A gross feed in tariff pays a premium on all electricity produced whereas a net feed in tariff pays on surplus energy created by the system. In Pakistan, net feed in tariffs are predominant. Learn more about feed in tariffs here.